The PesaZone lending platform assists trustworthy customers by issuing unsecured loans fast!. Download the App to start borrowing! Fast Unsecured Loans, no paperwork! Install the App and Launch! You will be prompted to provide your identification details and for permission to collect your personal data including your SMS history. We will then determine your credit score based on the information we currently have about you, this may include CRB (Credit Reference Bureau)Reports and M-Pesa transactions history. Then select the loan details or the Request Loan option to view the payment terms including the weekly installments. If you accept the loan terms and our User Agreement, you may submit the loan request. You should receive the cash via M-Pesa on the verified phone number within 24 hours. The loan should be repaid in line with the repayment installments quoted on the loan terms, overdue loans will lead to penalties, blacklisting and initiation of recovery measures by PesaZone. You may repay your loan before the due date, this also helps in building your credit rating. To repay your loan, use the M-Pesa Paybill number 754285 and provide the account number as the phone number you registered with in the local format. e.g. 0712345678. You may also use the App to view the balance, account statement and the repayment instructions. Open the PesaZone and select the Register option on the Login screen. Then provide your National ID number, Safaricom phone number, Name, Date of Birth and create a 4 digit PIN. You will be using this PIN to login to PesaZone and request for Loans. The PIN is not related to your M-Pesa account. What ID number and PIN will I use to login? The PesaZone PIN number is not your M-Pesa PIN. To login, you will be requested to provide the details you registered on PesaZone with. If you have not yet registered, open the App and go to the Registration option. The registration details are your National ID, Safaricom Phone Number and a 4 digit PIN number that you will be using to Login. Will you ask for my M-Pesa PIN? No. We will NEVER ask you for your M-Pesa PIN or Password. When creating a PesaZone account, you will be required to create a PIN that you will be using to access PesaZone. This PIN will be your secret and you will be using it to request for loans on PesaZone. Can I use my Airtel/Orange/Telkom phone number to register? I'm listed negatively with the CRB, can I still register on PesaZone? Sorry, we don't accept users having negative CRB records. If you have forgotten your PIN, we will send you a new PIN via SMS once you confirm the Phone Number and National ID number that you registered with on PesaZone. Open the App and go to the Forgot PIN or Reset PIN option. Can I change the details I used to register? Can I change my Phone Number or ID? The App has Crashed or it's not working, what do I do? Can I login on a different phone? Yes. You can Login from a different phone once you install the App by using your PesaZone PIN. Once logged in, open the Menu and go to Loan History. Your previous loans will be displayed here. Why should I trust PesaZone? PesaZone and the M-Pesa Paybill number 754285 are owned and operated by PesaPro Limited - a Limited Liability Company registered in Kenya. We offer transparent services and as a result, PesaZone has received positive ratings from indipendent reviewers on the Google Playstore, visit the store to see what other customers are saying about us. What will be my Starting Loan Limit? 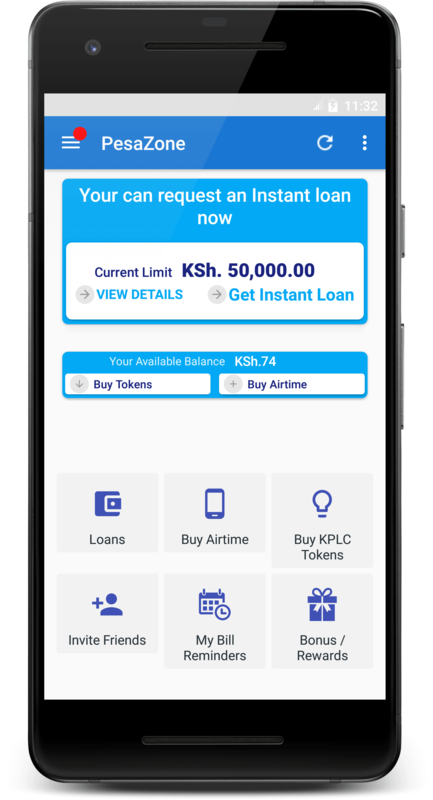 Once the App determines that you qualify for a loan, it will automatically show you the Loan Limit/Maximum Amount you can apply for. You will then be able to select the preferred amount within this limit and request for a loan by submitting the application. The terms and applicable fees will also be displayed. Why do you ask for a 1 Bob verification fee to offer a loan? In order to ensure that you are the rightful owner of the M-Pesa number that you registered with, we request you make a 1 Bob payment which is the minimum amount supported by M-Pesa. This means that we have already checked your records and confirmed that we are ready to offer you a loan. Immediately the payment is received, you will be able to request for loans, the minimum loan we offer is KSh. 250.00 which is much higher than this fee. We will refund the payment if we are unable to make a loan offer to you. Why should I try again after 7 days? There are cases where the records avaiable to us are not sufficient for us to make a decision, thus we request you to retry after some time as we hope more records will become available. Sadly, we can't guarantee you that after this period the available records will be sufficient. I receive loans from other Apps but PesaZone says I don't qualify. Why? The credit rating criteria varies between lending Apps, some Apps might offer you a loan while others deny the same. Payments are applied automatically within 10 minutes, in case of a delay, please send us the details of the M-Pesa confirmation SMS via the Chat option on the App or via email to support@pesazone.com. Any penalty applied to your loan as a result of a payment delay on our side will be removed once you notify us. How long will I wait after submitting the loan request? All loans are issued within 24 hours. But we usually send the money within 5 minutes on average. You may chat with us on the App or email us in case the delay takes over 12 hours. What are the interest rates/loan fees? We don't charge additional fees apart from the Facilitation Fee, however, penalties will be applied if you don't repay your loan in time. What is the Faciliation Fee? Will the loan fees/interest rates reduce? Can I choose a longer loan repayment period? The repayment period varies based on the loan amount. A longer repayment period is currently available for loan amounts of KSh. 3,000 and above. You can then select a different repayment period by using the drop down displayed next to the Loan Repayment Period field. When will my limit increase? At minimum, your limit will increase every time you receive and repay two loans in the same limit. E.g. When your loan limit is KSh. 10,000.00 and you apply and repay 2 loans of KSh. 10,000 each. However, your limit will increase much slower if you delay in repaying your loans and it will increase faster if you pay in advance. The limit increases by much larger margins for loans of higher amounts. You can try restarting the App, but kindly contact us if the issue persists. The loan repayment instructions are displayed on the App. You can repay via the M-Pesa menu using the Paybill Number 754285, your Phone Number is the Account Number. Can I pay the full balance at once? Yes, you can repay the loan balance at once. Can I pay from a different phone number? Yes, we encourage you to repay in advance as there are no penalties and this helps improve your credit rating. You can repay the loan in installments, this helps reduce the loan balance and also reduces the penalties in case a loan is overdue. However, the total loan amount should still be repaid by the due date. Is it okay to repay after the due date? The loan should be repaid by the due date as per the Loan Contract. Failure to repay by the due date will lead to instant severe penalties, negative CRB reports, reporting to Debt Collectors and we may contact your close family and friends for assistance. Any overpayment is applied to your account and it's automatically applied to settle your future loan(s) thus reducing the loan balance. The overpayment will be displayed on the Account Balance section on the App. We automatically deduct the loan balance from your overpayment once a loan is issued. What is the Facilitation Fee? Can I view my Previous Payments? Yes. Once logged in, go to Menu > Account Statement. The transactions in your account will be displayed, use the More button to show older transactions. What happens if I don't repay my loan in time? The loan should be repaid by the due date as per the agreement. After the due date, a penalty will be applied on the loan balance thus increasing the repayable amount. We may also submit a negative report about you to the CRB, forward your details to Debt Collectors or contact your close friends and family for assistance in reaching you. By not repaying your loan on time, you are denying a fellow Kenyan the chance to obtain a loan. What happens once I default on a loan or if I do not repay? By defaulting on a loan, you are breaching a Legal Contract. We will share your details and data with our Debt Collectors who will approach you physically or contact you and friends/family for loan recovery purposes; we may also use CRB reporting. By not repaying your loan on time, you are denying a fellow Kenyan the chance to obtain a loan. How are the loan penalties determined? Penalties are applied in line with the loan agreement as stated on the loan terms when applying i.e. on a weekly basis starting immediately a loan falls overdue. The penalty is applied on the loan balance using the weekly rate stated on the Loan Terms displayed as displayed on the loan application. By not repaying your loan on time, you are denying a fellow Kenyan the chance to obtain a loan. Yes, the penalties are charged in line with the loan agreement to ensure fairness since by not repaying your loan on time, you are denying a fellow Kenyan the chance to obtain a loan. CRB means the Credit Reference Bureaus. The CRBs keep records regarding creditors, the records are mainly used by credit institutions such as banks and SACCOs to determine if someone is a good borrower. The records can also be used by Employers and any other authorized person. What happens if i'm reported to the CRB? Creditors and Employers refer to the CRB when doing background checks, thus you may lose a dream job or a chance to obtain a bigger loan from banks and SACCOs because of a small loan you defaulted on years ago. Even after you clear with the CRB and repay a loan, a negative CRB record lasts 7 years regardless of the loan amount you defaulted on. Which CRB will you report to? How can I make my limit Increase faster? The limit will increase faster if you ensure to repay in advance or in time. How do you determine how my limit will increase? The limit increases by much larger margins for loans of higher amounts. Where do I enter the invitation/referral code I received? How can I invite someone else? Open the Menu and go to Free Loans. You can click on the Share button and then select how you wish to invite, e.g. via SMS, WhatsApp, Email e.t.c. You can also copy the code and paste e.g. on the Internet. How do I earn money by sending Invitations? When you invite someone and they use the code or click the link to install the App, and the person then qualifies for a loan. You will be notified once they complete repaying the first loan. We will automatically deposit the bonus to your PesaZone account. How do I claim my bonus/rewards? We will notify you each time an invite repays the first loan. The reward/bonus is then automatically deposited to your account and it will be applied to your next loan automatically. Therefore you will repay your loan less this amount, and if the rewards exceed your loan balance, you will not pay anything as it will be a FREE LOAN! How will I know if the person I invited has repaid the first loan? No. There is no limit, you can invite as many friends as possible, this increases the potential rewards! How can I call or contact PesaZone? To ensure efficiency, we provide support services online; our customer service team is accessible online via the Chat option available on the App (Messages), or by emailing us via support@pesazone.com. Thus we do not provide service over phone calls or via office visits. How can I visit your office? Can I reverse a payment made to the PesaZone M-Pesa Paybill? Your payment can be reversed if you are not a PesaZone customer or if you are not qualified to receive a loan from us. Please email us your reversal request via support@pesazone.com. Kindly note reversals take up to 7 days. We are an online lender providing unsecured loans on a 24 hours 7 days a week basis. PesaZone helps trustworthy individuals who are in need of quick loans.